On some days, I feel like a squirrel! Because leap years are seen as unusual events that disturb the otherwise orderly progression of days/months/years, certain beliefs have been attached to them. (One constant in the realm of folklore and superstition is that out-of-the-ordinary events are deemed to have out-of-the-ordinary consequences or properties.) Leap years, according to folk tradition, were the only times when women could propose marriage to men, with this belief often termed "The Ladies' Privilege." Yet even within this hypothesis there was disagreement as to how far it went -- a great many of those who encountered this custom did not see it as applicable throughout the length of a leap year, but only to the extra day itself; that is, only to February 29. I have two sets of grandparents who were married during a leap year -- though neither on LeapDay. The same leap year even - 1936. 18 leap years ago. My maternal grandparents managed it by the skin of their teeth on December 31. It's not clear who proposed to whom, or whether Leap Year figured into their plans at all. Coincidentally, both marriages were conducted by a Justice of the Peace, with only the required witnesses. While all four participants lived in St. Louis, MO at the time, both marriages occurred in Illinois. No family members were in attendance at either one; primarily because family hadn't been informed. Both sets of my grandparents were married on a spur of the moment. A leap of love. I was planning on starting this series next week, but a quick post idea occurred to me. Many genea-bloggers have ancestors from foreign countries which often use foreign characters in their character sets. You may know how to draw those characters in your own handwritten notes, and may even be able to get your word processor to reproduce them. However, you may not know how to blog them. Participated in my first ScanFest today. It was productive, and fun. I scanned 46 photos in total. The conversation among the scanners varied from lingerie to applying for SAR/DAR membership. Reminded me of my college days chatting on Relay. Things are a little different twenty years later, but not much. Here's one photo I scanned. 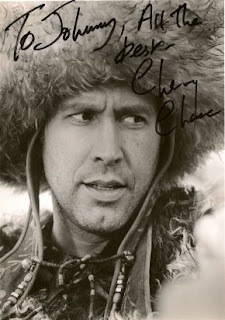 It's a personalized autographed photo of Chevy Chase. The picture is from his 1985 movie, Spies Like Us. The photo was obtained for me by a cousin in 1986 while I was in the hospital. This is one of only two autographed photos I scanned today. I have a large collection of those, but most of them don't have special meaning beyond being autographed photos of mostly actors. The other I scanned was a photograph of US Representative William L Clay, for whom I interned during the Summer of 1990. He gave each of his interns an autographed photo at the end of the internship. Unlike Chevy, he wasn't wearing a hat in his photo. Here's another photo I scanned in - of myself. 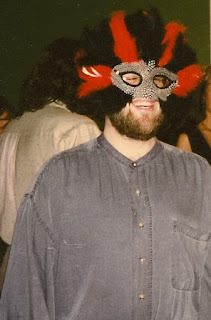 An uncle of mine was married in New Orleans, and a trip was made to a local store for everyone to buy a Mardi Gras mask - even though it wasn't Mardi Gras at the time. The photo on the left is clipped from a larger group photo, since I don't like posting photographs of living people without their permission. (Famous actors are an exception.) I wasn't surprised by it, but I could easily identify everyone in the entire family group shot - even though I couldn't see anyone's face. Clothes and body shape are sufficient if you know people well enough. But I also know that's one photo that has to be labeled, or it will be completely useless to future generations. As a long time fan of SF/Fantasy novels and movies, I have learned from experience that genre movies don't win Best Picture, Best Actor, or Best Director awards. Fans must settle for Best Special F/X, Best Makeup, or possibly Best Soundtrack. There are the exceptions (2001: A Space Odyssey; Lord of the Rings) but the exceptions are rare. What technology do you most rely on for your genealogy and family history research? This isn’t difficult. Besides my computer, the piece of hardware I currently use the most is a microfilm reader. There are a lot of records that haven’t been scanned in, haven’t been indexed. They know me by now when I enter the Special Collections department. One web site/blog (besides your own) that is indispensable to you. If I had to recommend one database subscription site to someone, this would be it. Others have been useful, but it’s hard for me to imagine where I would be without Ancestry – from what I have learned through their databases and forums. This is where I am most likely to deviate from a lot of answers. I have set up two family wikis – both password protected – one for my mother’s family, and another for my father’s. Here’s a view of the the homepage of my mother’s, as well as one entry on the site. The images should look familiar to anyone who has experience with Wikipedia or any of its cousins. It uses the exact same software. The original theory behind installing the software was to facilitate other family members helping me in recording the information. Theory and practice aren’t always the same. I think only one edit has been made so far by anyone except me. However, even when a cousin sends me an email with text for me to put onto a page, that’s helpful. And it’s easier for me to update a wiki than it is to update other types of family websites. I've uploaded images of almost every document I have found. Most of the more recent entries have several photographs on them. I’ve been meaning to do a series of posts on my knowledge of and ideas for websites, including a few more snapshots of our wikis. Hopefully I will get a round tuit soon. Too many of these posts and people will be paraphrasing line 230 from Act III Scene II of Hamlet. 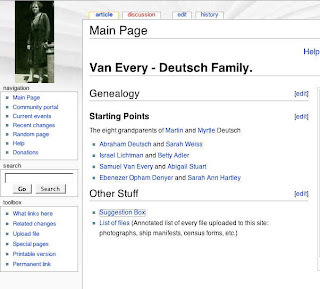 However, while this isn't the reason I am researching my family history, I believe I have found support for at least one more, and I'm close to another of the 'famous people' Ancestry's One World Tree claims my grandmother, Myrtle Van Every, was related to. I've had fun laughing at some of the impossible family trees the OneWorldTree software draws, but the lousiest ball player will occasionally hit the ball. Alas, the hits are not necessarily the hits I'd have chosen. On the main index page of their Learning Center, if you scroll down you will see "Facts About Your Surname", and an input box to enter your surname. You don't need to have a paid Ancestry account - though if you do, there are links to the databases for the actual records, which of course the books don't have. AnceStories has announced the upcoming ScanFest. This will be the first one I participate in. If I do my time zone math correctly, it will be from 1 pm to 4 pm Central Daylight Time. I have reread Sally Jacobs' "8 Blunders People Make" and cleared some albums of photographs I wish to scan. There are probably more than I can scan in 3 hours, but whatever I accomplish will be more than I would have probably done anyway. I don't believe it's too late to sign up now, and you don't have to be a blogger to do so - Miriam includes instructions in her post. The 42nd Carnival of Genealogy has been posted. 23 Geneabloggers have chosen their five best posts from 2007, creating a Best of the Best carnival. Since I started blogging midway through the year, and there are several bloggers in the group I have only been reading recently, a lot of it is new to me. Which is good. Technology. What technology do you most rely on for your genealogy and family history research? Select one piece of hardware (besides your computer), one piece of software (besides your internet browser), and one web site/blog (besides your own) that are indispensable to you...The deadline for submissions is March 1st. Read the post for full instructions. I quickly went and typed in my own surname. The results turned up 1 person born in 1889, and 3 appearances of another born in 1909. I knew about the latter, as I discovered her on the Missouri State Archives awhile back. She's a daughter of Sol Newmark and Sarah Nathan (the couple married in the Great Synagogue of London in 1901.) She didn't live long enough to appear on the 1910 census. The 1889 individual wasn't in the State of Missouri database, though I don't know why not. I was aware of Newmarks in St. Louis prior to our family, and they either died or moved before we showed up. I haven't yet figured out whether or not they were related. However, no other Newmarks appared in the results, and this was supposed to be 1805-1980. That suggested some serious gaps. My great grandfather, Barney, his brother Sol, and other brothers Max and Israel, all reproduced some more, and there were many grandkids. And great grandkids, too. A little more research revealed there was 1 entry for 1934, another for 1933, and 5 for 1932. I think more than 7 people were born in Missouri from 1932-1934. In 1931 there's a sudden explosion of results: 50. I'm not quite sure what's going on, as in 1912, the year my grandfather Melvin Newmark was born, there is only one entry. Not him. I suspect some counties in Missouri may have released some more recent records. The big question in my mind, since there is a significant, if not completely sufficient, privacy window between 1934 and now, is those four *certificates* from 1951, 1966, 1973 and 1980. I sent Juliana at Ancestry an email notifying her of this issue. The compilers of Confucius' descendants have been working for ten years, and have finally decided they're finished. "We have received more than 1.3 million new entries and already stopped soliciting new ones." The database is closed, for now, and since this is only the fifth time they have ever updated the list, if you didn't get on it, maybe your great great grandchildren will. Since I have a 3-day free trial, my goal was to find everything I could possibly find on Footnote, and then cancel my subscription before they start charging. They are adding databases constantly, though at the moment I don't see enough hits for my surnames to warrant continuing my subscription. They also offer individual image download, though if there are more than four images, it's worth buying a month's subscription. The two databases that show the most promise for me are in the process of being entered. I'm not sure why the years between 1910 and 1926 aren't part of the database. They are 47% finished. However, I have already found a few certificates for relatives of Myrtle Van Every, my maternal grandmother, who was born in Texas in 1900. Her oldest sister, Minnie Van Every Benold, had two children between 1903-1910 (Shirley and Margaret). I found Shirley's certificate, as well as the certificate for Corinne Griffith, Shirley's daughter, born in 1927. I also found the certificate for Melvin Edwin Denyer Jr, who would have been Ebenezer's great-grandson. His father was Myrtle's first cousin. This is only 4% entered, but there are going to be a lot of certificates from this database that I know I will download. At least five of my grandmother's siblings, and both of her parents, for starters. And then there are nieces and nephews. I'll just wait until they're all there, and then buy a month. Though if there's a delay, there is one or two I might spend $2 to download individually. I already have Myrtle's mother's death certificate. I ordered it because I knew she died in her fifties, and I wanted to know what from. I don't have her father's though. Myrtle's oldest sister, Minnie, was born in 1884, and she wrote a brief description of Sarah, and her recollection of the home Sarah and George lived in. She didn't write down years, or her own age, but I suspect she was older than 6 when Sarah died. Of course, how much information is on the certificate, and whether it will be identifiable as my great-great-grandmother will depend upon the informant. I signed up for a 3-day free trial of Footnote this weekend. There was a 28-page dossier on my Civil War ancestor, Ebenezer Denyer, which I wished to download. Turns out he was a regimental teamster, and a "Regimental Return" form was filled out for him on an almost monthly basis, so a lot of the pages are repetitive. So how well does the documentation match up with the brief bio that appears in: A Brief History of John and Christian Fretz and a Complete Genealogical Family Register With Biographies of their Descendants from the Earliest Available Records to the Present Time – by Rev A.J. Fretz of Milton N.J. copyright 1890. Mennonite Publishing Co. Elkhart, Indiana. pp. 326-333.
he joined the 2nd, Texas Company Volunteers, mustered at Marcos, Hays County, in the summer of 1861, and served throughout the war in the Confederate service. He was taken prisoner at Vicksburgh, Mississippi, was exchanged, and laid in the hospital at Galveston until the close of the war. Company is correct. He actually enlisted on June 12, 1862. The "Second Company" itself wasn't formed until September of 1861. 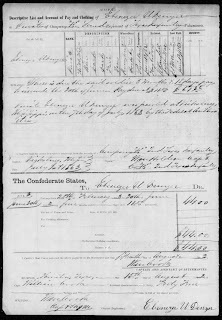 There's a Regimental Return form filled out for every month from March 1864 until April 1865 identifying him as a teamster, so I don't think he was in the hospital until the close of war, unless there were teams of horses for him to drive through the corridors of the hospital. However, the 'Descriptive List' says he was paroled by 'the medical authorities', so maybe from July 1863-March 1864, which is a significant amount of time. On the other hand, there are no hospital forms in the dossier -- I'm not sure if those would have been kept separate or not. 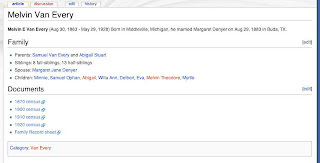 One thing I am curious about the Fretz history is who submitted the information for Ebenezer's family. Rev Fretz supposedly began researching for the book in 1872, which is when Ebenezer died. His brother Samuel, and sister-in-law were both deceased too. He had one sister, Elizabeth, and one brother, William, who may have submitted the information. His wife Sarah is another possibility. That's the biggest problem with the book - there are very few citations. As I mention on my new blog, I've done this before, seven years ago, before I knew about blogging. The past few days I've been going through my own photo albums removing photographs I wish to scan. This morning, February 14th, before work I turned a page and found this photo I decided I had to share. 2) Seeing this photograph of my grandmother, Sissie (Feinstein) Newmark, and me -- on the morning of Valentine's Day - makes me question the randomness of events. In particular, it's time for the First Annual Academy of Genealogy and Family History iGene Awards. These are awards given out by genea-bloggers for their best posts in the previous year. According to the stated rules posts between Jan 1 and Feb 15th are permitted to receive awards. Even though for sentimental reasons I like looking at the photo of myself at age 13 with my grandparents, I think my favorite photo is of my grandfather in Egypt during WWII. The combination of history with family is appealing. The sandbags make the photograph unique. It was difficult choosing a family story I shared which I thought would make a good movie, because I haven't shared many family stories. One story I considered briefly I decided deserved a different award. I then realized that the best movie could probably be made, not from something I wrote, but from something a collateral ancestor of mine wrote. This poem covers a lifetime of struggles and hardships. It would be a depressing movie, with few special FX. Not the typical movie I like to see. Which probably means it would be a critical success. I don’t know who I would like to cast as I don’t know what any of the key players looked like. Here I took the marriage certificate of my great-grandfather’s brother, and researched what I could from the names, and places I was given. 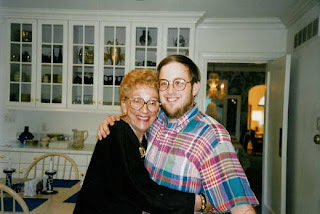 As a sidenote: the second-great-granddaughter-in-law of the Cantor found the article and left a comment, and I found a few more links for her which can be found in the comment thread. The winner of this category is the one I briefly considered for Best Screenplay. The post is mostly a partial transcript of an audio tape. It narrates a tragic event in Transylvania as told by my grandfather and his brother seventy years afterwards. GeneaBloggers were challenged by CowHampshire to post something funny, and this was one of my contributions. I went to a Hobbit Name Generator and converted the names of all my ancestors through four generations and then created a tree-chart using my genealogy software. I recognized your voice, Grandma. You have four grandparents, and you had five categories, and still, you forgot me! With everything you've written about the Dudelsacks, you think you could have found an award for one of those posts! The last one. Selig is the only ancestor whose Hobbit-name I mentioned in the commentary that went along with the post. And you're going to be in my next post. I am? Well, alright then. I finally believe that I will one day be able to extend my family lines back 800 years, perhaps 1000! That would make my task easier. Just a matter of waiting long enough, and keeping track of descendants. Of course, this assumes the world's politicians don't destroy the Earth in that time period due to Malthusian Principles. If The Genealogue is correct and WorldConnect isn’t a Primary Source…-- and I am inclined to agree --OneWorldTree definitely isn’t. Terry is sponsoring the First Annual Blogger Poet Roundup. Since I enjoy both reading and writing poetry, I couldn't not participate. and the sixth line must rhyme with the first three. Originally he called it a limerick, and said limerick meter was optional. Then he revised the post to indicate it was a sestet - like the last six lines of a sonnet. He said nothing new about meter, so I decided to write my sestet in pentameter (five feet). Though I'm certain there are several feet that aren't iambic. He said I could submit three, so this is my first submission. If I compose any more, I will tack them on to this post. He’ll uncover where ancestors have been. More he hopes others find interest in. or explain how to download videos from youtube. I don’t believe I’ve mentioned my goat. Yesterday on the Ficlets Blog, writers were challenged to write six-word memoirs. Stole bread. Prison. Pursuit. Barricade. Death. Don't worry. Despite the last word, I didn't really spoil the book for anyone. There's a lot left out of those six words. Today, Terry Thornton of Hill Country of Monroe County challenged bloggers to write their own 6-word memoir. This isn't a phenomenally strange coincidence. There was a recent publication of a collection of six-word memoirs. (Good friends * loving family) + health = happiness. The newspaper's anti-Temperance Movement stance may have encouraged a struggling company to advertise there. The advertisements were single lines intermingled with local announcements submitted by the community. "Have malaria? Drink Missouri Cider." "Bilious? Drink Missouri Cider." (Actual wording.) I'm not sure about the research that went behind the claims. Of course, they really weren't claiming it would help, were they? They just wanted you to drink their product. The only other discovery I made today was the Wm Prufrock Furniture company. They advertised a lot in the paper too. And since TS Eliot was born in St. Louis in 1888, I wondered: "Is this where he got the name?" It turns out that I am not the first to discover this. (I'd have been surprised if I were.) TS Eliot stated in 1950: "I did not have, at the time of writing the poem, and have not yet recovered, any recollection of having acquired this name in any way, but I think that it must be assumed that I did, and that the memory has been obliterated." A very minor case of cryptomnesia. I found nothing about my ancestors. I decided to run the MyHeritage software through a few more tests using a family photo of the Deutsch family. 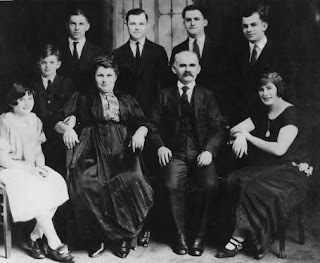 My great-grandparents and their seven children. (taken at some point in the 1920s.) The photo is perfect since most of them are directly facing the camera, which helps the face recognition software. I'm unable to distinguish at the moment between two of the brothers since they're close enough in age and I don't have other photos to compare with. However, the oldest daughter is Jean, the youngest daughter is Berta, the oldest son is Ted, the youngest son is Allen, and I recognize my grandfather. That's five more tests I can run. I happen to agree with the results. I could almost get Allen and Helen confused. Luckily for Samuel, his daughters are a little more balanced. My great-grandmother's genes appear to have had a tendency towards dominance. I've been conducting pajama research for the past six months. Quite successfully, I think. However, I have recently begun visiting the local library a lot more often to go through their microfilm holdings, and at the end of January paid the dues to join the local genealogical society for a year. I could wait for the microfilm holdings to go online, but I could be waiting a decade, or longer, and I'm not that patient. I've seen devices advertised online that will convert microfilm to digital images, but at $40,000, I suspect libraries, and genealogical societies, aren't yet lining up to buy them. But if the price decreases, I suspect they will. When that day comes, the conversion process will speed up. The St. Louis Genealogical Society does have some attractive offerings to members. Discounts on classes and seminars is one of them. In particular, they offer a Beginning Genealogy course for $60 to non-members, and for free to members. Still feeling I qualify for that course, I figured that it was worth $35 to see if I could learn anything. Checking out their course list, I'm not too thrilled with their other offerings for this season. The ones that would interest me the most (on military research) are scheduled during the weekday lunch hour. It's likely the majority of membership is retirement age, but I'm not, so I can't attend those classes. Beyond the discounts on courses and some CDs they offer, there isn't much they provide to the member only. There is a lot of good information on their website available to anyone, and I've been using it the past 6 months. The Members-only section has a marriage database from 1804-1876, but none of my ancestors were in St. Louis by then, and anyway, they sold the database to Ancestry.com, so it's available there. They have a section for the pedigrees of "First Families", but once again, my ancestors haven't been here long enough. (They've been here since the 1880s. It's not like they arrived last year.) Beyond that the only other Members-Only feature on the website is the opportunity to volunteer to do data entry. I may, but that's not really a benefit. I'm not upset that the society gives most of their information away, but it might not make the most business sense. So if I don't feel I'm getting my 'money's worth' from the discounts on classes, or find another benefit, my renewal in future years may be open to question. 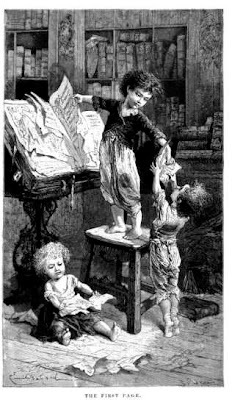 However, I do feel that the experienced genealogists in the society have knowledge about resources I lack. I've learned stuff at every presentation at every monthly meeting I have attended so far. Oh. (pause) You're really from the future? Cool! Please tell me Apple no longer exists. It's true. You own an Apple. It's that Apple I was telling you about. Computers have improved a little, haven't they? What happens if I click on this? Search engine? What happens if I type... (types: Cheryl Ladd) and click search? Wow! I can't believe it, less than five seconds. (turns off computer) Back to what I was here to talk about. Your Bar Mitzvah. You did great! I skipped over a line of Hebrew in my Torah portion. You're the only one who noticed. You know, your beard makes you look a little like my uncle looked a couple years ago, before he shaved it off. Our uncle. Yes, Grandma liked it. She'll be around for awhile, don't worry. She makes it to the 21st century. That's good. My other grandparents? They're all gone in ten years. Cancer. Don't ever pick up a cigarette. Can't tell you too much about your future. It could change it. Yeah, I know. Can you get me a soda? It's been twenty years since I was inside the synagogue. 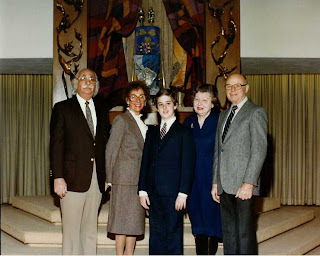 The congregation moved in the 1980s to a new building. But I'll be returning. The building was sold to The Missouri Historical Society and it is now the Missouri History Museum Library and Research Center. There are some good resources there I know I will be going through. I suspect it will feel strange though, since the old sanctuary is now a reading room. * Note: There is one anachronism in the above conversation. The Commodore 64 wasn't released until August of 1982. My maternal grandfather would give the family our first computer that December. Oh, well, I don't have any 1983 photographs nearly as good as this one. On my right (your left) are my paternal grandparents, and on my left (your right) are my maternal grandfather, and his second wife. They were married three years prior to my birth. I knew in 1982 that she wasn't my biological grandmother, but I have no recollection when I was told. I still considered her my grandmother, though. She died in 1985. My mother's father died in 1991, father's father in 1992, and my father's mother made it to 2002.